TWO children who received neo-natal care as babies returned recently to Altnagelvin Hospital to say thank you with a cheque. 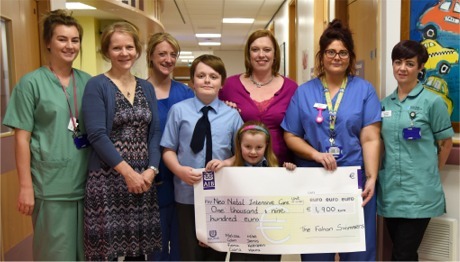 The presentation of €1,900 and £200 to the hospital's Neo-Natal Intensive Care Unit was made by swimmers Fiona Kerr and Kathleen McGinley and Kathleen’s two children Leah and Dara. The four took part in the Fahan Summer Swim Challenge during the summer months, undertaking several sponsored swims in Lough Swilly as part of their fundraising drive. The donation was made to the Neo-Natal Intensive Care Unit "in recognition of the care given to Leah and Dara when they spent time in the unit as babies". Catherine Griffin, Heidi Devine, Shauna Gibson and Lorraine Deeney received the donation on behalf of the unit. Meanwhile, the Western Trust gratefully acknowledged the "generous donation" made by the swimmers.